This is one of my favorite photos of Dallas — mainly because it’s in COLOR! This absolutely fantastic photograph is from Noah Jeppson’s great website, Unvisited Dallas. Here we see Elm Street, looking east along Theater Row, taken from about the middle of the 1400 block of Elm. (To get your bearings, Gus Roos was at the northwest corner of Elm & Akard.) I LOVE this! 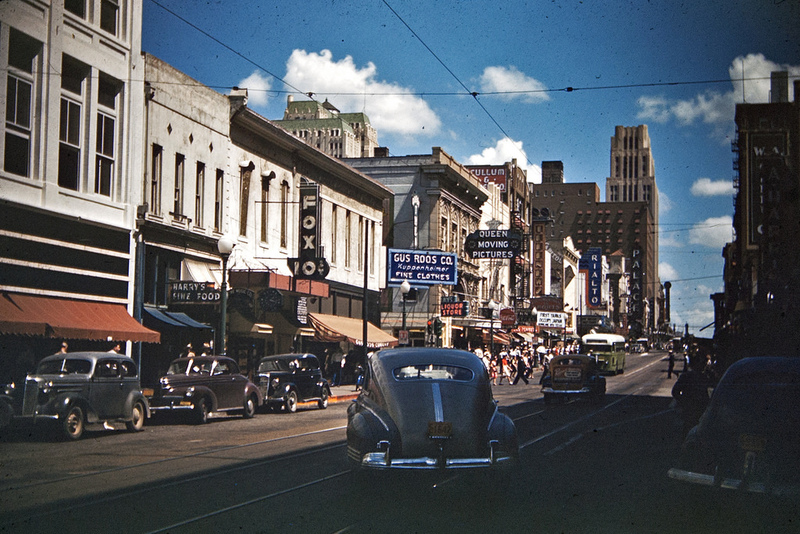 Photo from Noah Jeppson’s Unvisited Dallas post, “Elm Street 1945” — see the original post and read Noah’s description of the buildings seen in the photograph here. I don’t know where this photo came from, but I hope there are more color photos from this era out there. I would love to see them! Other photos of this block (sadly, none in color) are in an earlier Flashback Dallas post, “Building Collapse on Elm Street — 1955,” here.